Tyler Brown’s (15) shot finds the back of the net to give the Royals an 8 to 3 third period lead. 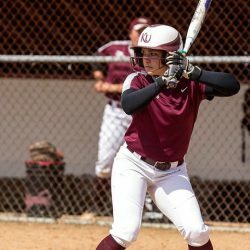 KUTZTOWN, Pa. – Junior outfielder Sara Keeny of the Kutztown University softball team was recognized as one of the top players in the Atlantic Region on May 10, as she was named All-Region Second Team by the National Fastpitch Coaches Association (NFCA). It is the third All-Atlantic Region honor for Keeny, who was also voted to the All-Pennsylvania State Athletic Conference (PSAC) Eastern Division First Team last week for the third time in her career. The Warminster native had a career year at the plate, batting .424 with seven doubles, five triples and 18 RBI, all career-highs. She also had career-highs in slugging percentage (.560) and on-base percentage (.468), in 36 games started during the 2018 season. Keeny finished with 24 stolen bases, which led the PSAC. Her .424 batting average was second, .468 on-base percentage was eighth, and five triples ranked first. In the KU record books, Keeny is tied for third all-time with 89 career stolen bases, which is tied for fourth all-time in PSAC history. Her .424 average at the plate ranks ninth all-time at KU for a season, and her .407 career average is tied for second all-time.